Israeli Soldiers Torture Another Man for Organizing Demonstrations, UPDATED with Graphic Photos and Video. | The Only Democracy? The Only Democracy? » Human Rights Activists in the Crosshairs » Israeli Soldiers Torture Another Man for Organizing Demonstrations, UPDATED with Graphic Photos and Video. Israeli Soldiers Torture Another Man for Organizing Demonstrations, UPDATED with Graphic Photos and Video. Omar Alaaeddin from the village of al Ma’sara was nabbed from the Container Checkpoint on Sunday the 14th. He was released yesterday with no charges pressed against him. 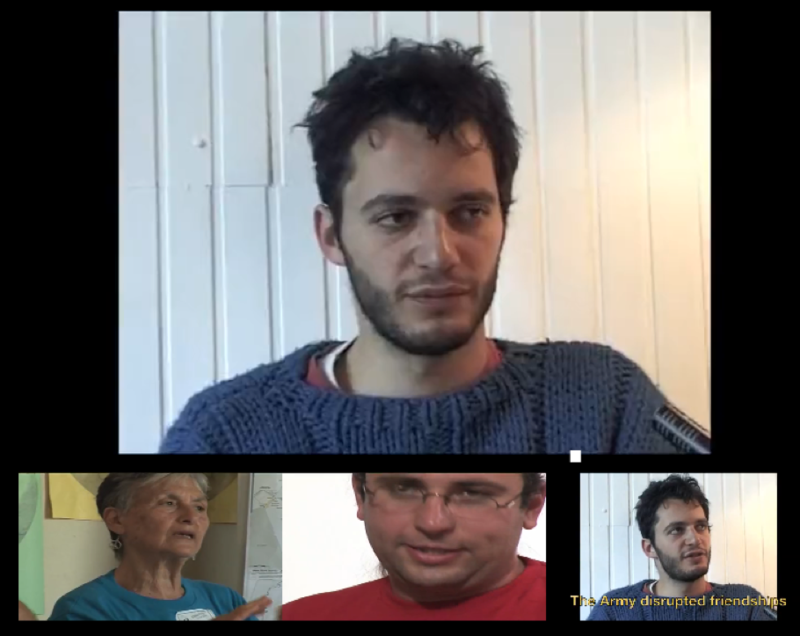 Alaaeddin reports having been tortured in the Israeli Russian Compound Jail in Jerusalem. Omar Alaaeddin, who is involved in organizing demonstrations in the village of alMa’asra south of Bethlehem, was arrested a week ago on Sunday at the Container Checkpoint, as he was making his way back home from Ramallah, with a group of students and university professors. The groups was in Ramallah to see a theater play. Alaaeddin was beaten repeatedly, both by the soldiers who detained him, and later, in the Israeli Russian Compound jail in Jerusalem. He reports to have been kicked, punched and even shocked with a taser by the soldiers and his jailers. 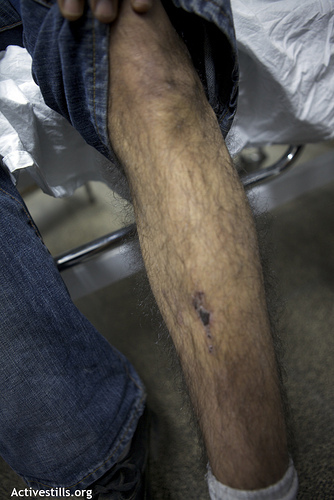 Alaaeddin, who suffered an injury to his leg from the beating, was questioned over an unsubstantiated suspicions of participating in demonstrations and assaulting the soldier who arrested him. Dozens of eyewitnesses who were at the checkpoint at the time of his arrest can attest to the fact that it was, in fact, Alaaeddin who was assaulted. He was finally brought in front of a judge for the first time last Sunday, which was also his first opportunity to see a lawyer and inform him of his torture. Following a short hearing, the judge harshly criticized the prosecution and police, saying there is no evidence connecting Alaaeddin to any violence and ordered his unconditioned release on bail. Despite having been injured and repeatedly having asked to see a physician, Alaaeddin did not receive any medical care throughout his detention. This is the second time this month that an organizers from alMa’asara are detained and assaulted at the container checkpoint after Border Police officers recognized them from demonstrations. On March 2nd, the mayor of al Ma’sara, Mahmoud Zwahre was detained and beaten on his way to a meeting in Ramallah. 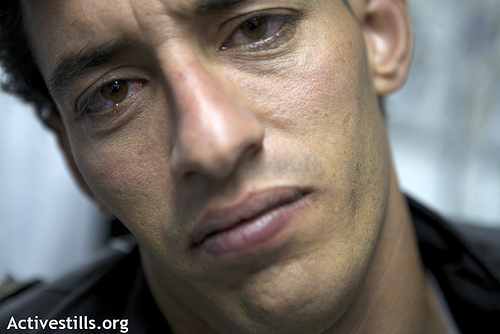 Alaaeddin and his lawyers are now considering the option of filing both criminal and civil suites in an attempt to challenge the impunity and unaccountability of members of the Israeli armed forces. 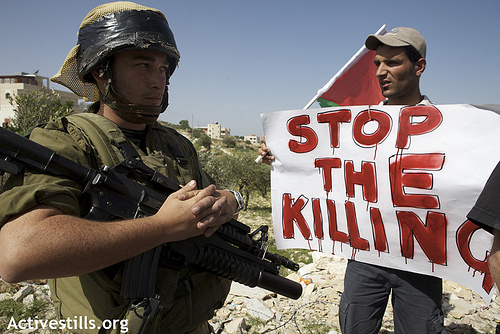 Two Youths Killed by Israeli Military, WARNING: Graphic Photos.